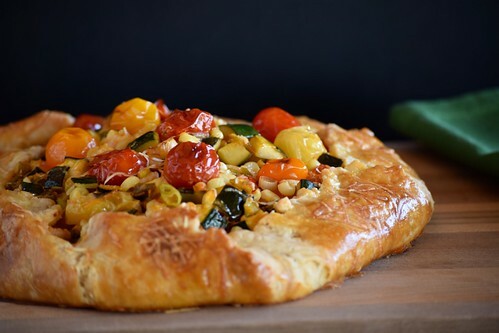 We have made this burst tomato galette with corn and zucchini from Deb Perelman’s Smitten Kitchen site three times this month and have loved it every time. The first one was made using freshly-picked sungold tomatoes from our garden, and when this beautiful pastry emerged sizzling and fragrant from the oven and we tasted it, we knew it had to be featured on our blog as soon as possible. So we were happy to prepare it again, this time to take pictures. Well, the dish turned out perfectly, but a few of the photos weren’t quite up to our standards… so we made it again! 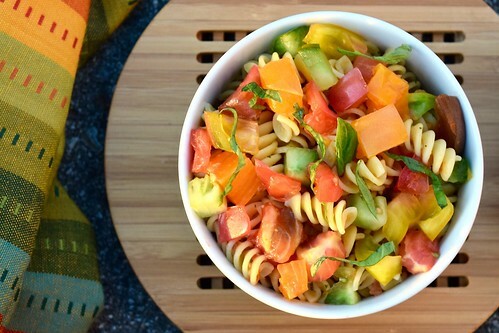 This is one of our favorite summer recipes for several reasons. First of all, it’s delicious. Secondly, it is incredibly easy to make: everything for the sauce is simply combined in a blender without ever being cooked. And what really makes this dish special is that these fresh, seasonal ingredients are only available for a few weeks, making it a rare treat that we look forward to all year long! 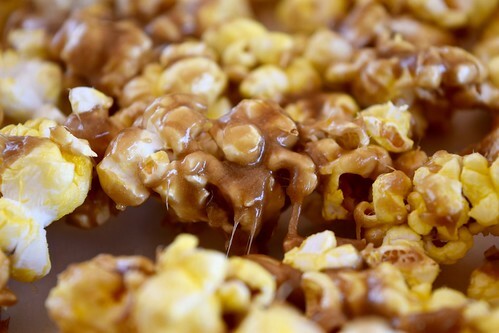 Everyone knows how easy it is to make popcorn, but did you know that with just a few extra steps you can have homemade butterscotch caramel popcorn?! A delicious combination of caramelized brown sugar, butter, and vanilla is poured over your favorite popcorn, then baked to a crispy and chewy, salty and sweet golden perfection. Plus, it takes just five minutes to make the creamy butterscotch, so the only hard part is having to wait patiently while it cooks in the oven developing its satisfying crunch. As the saying goes… if you don’t succeed, try, try again. Well, we did exactly that while searching for the best peanut-lime noodle dish. We tried so many recipes from different cookbooks and blogs online, but none met our expectations until finally discovering and perfecting this amazing South-Asain masterpiece. The sauce is so easy to prepare: it combines creamy peanut butter with brown sugar, fresh ginger, a clove of garlic, scallions, a generous splash of lime juice, and a sprinkle of red pepper flakes. 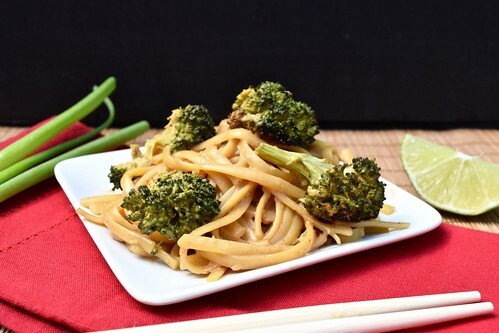 This smooth and delicious sauce is then tossed with linguine and tender oven-roasted broccoli, making a simple, healthy, and flavorful dinner that you can make in about 30 minutes. When you bring a cold salad to a potluck and it is the first thing to disappear, you know you have a winning recipe. We first made this crowd-pleaser for a tropical-themed party a few years ago, and it has been our go-to salad ever since. 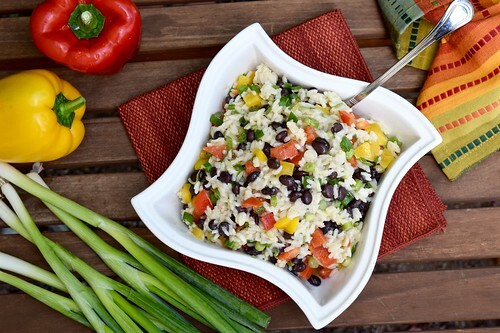 Loaded with fresh red and yellow bell peppers, sliced green scallions, black beans and rice, and seasoned with a zesty cuban-inspired dressing made with dijon mustard, minced garlic, and spices, this delicious and festive dish is a kaleidoscope of bright colors and summer flavors.